We typically decorate for Christmas the weekend after Thanksgiving. Once the tree is up, my kids love to see gifts under there. But it’s still early in the season and we haven’t done any Christmas shopping yet. 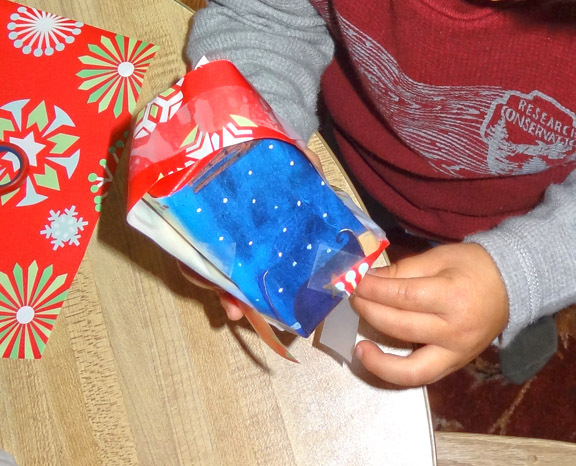 To satisfy their desire to see presents under the tree, I set up a simple gift wrapping activity that also provided an authentic fine motor experience. I set up a gift wrapping invitation to play for QBoy and XGirl. 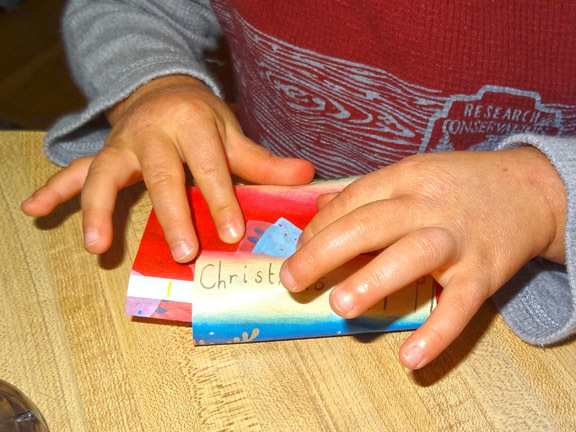 I included the wooden block “gifts” along with some scraps of wrapping paper, some tape, and some our kid-friendly scissors . My kids did not seem at all bothered by the fact that they were only wrapping blocks. As far as QBoy and XGirl were concerned, the blocks were real “gifts” and they were doing some important work! 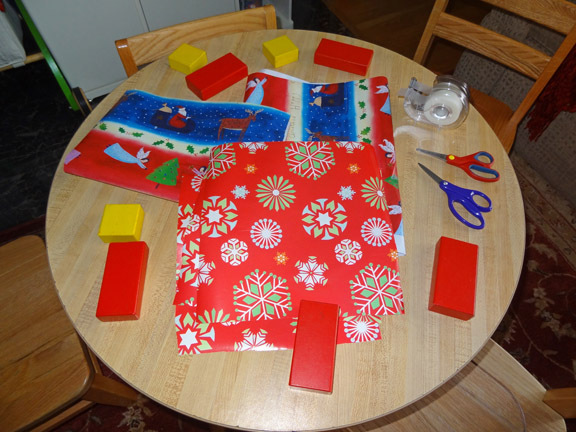 In fact, wooden blocks make great starter “gifts” for kids to wrap due to their shape and their firmness. 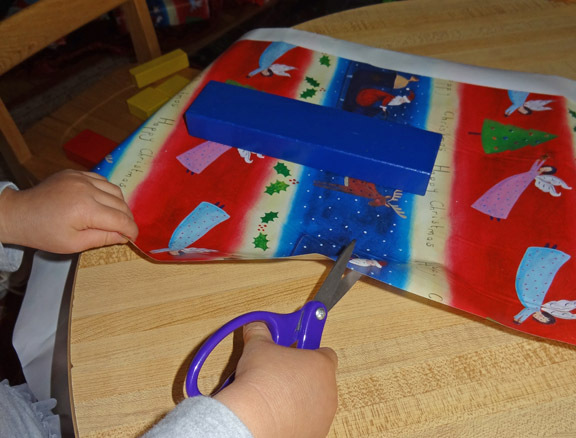 I showed the kids how to measure the right amount of wrapping paper to cut by laying the blocks on top. Their scissors skills got a good workout with this activity! My kids still love using tape. But tearing the tape off of the dispenser is still tricky for them. 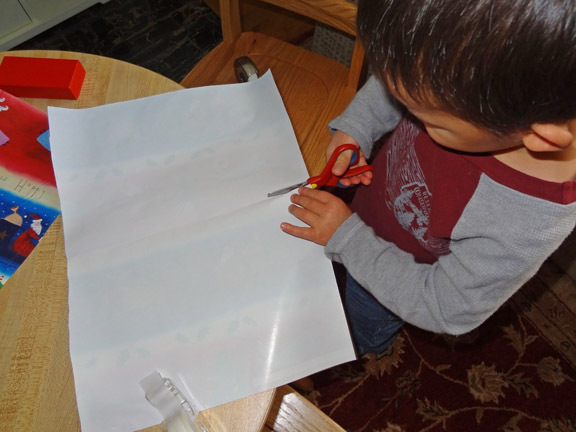 I showed them how to pull the tape down and to the side in order to cut it. This was another opportunity to develop and strengthen those fine motor skills. 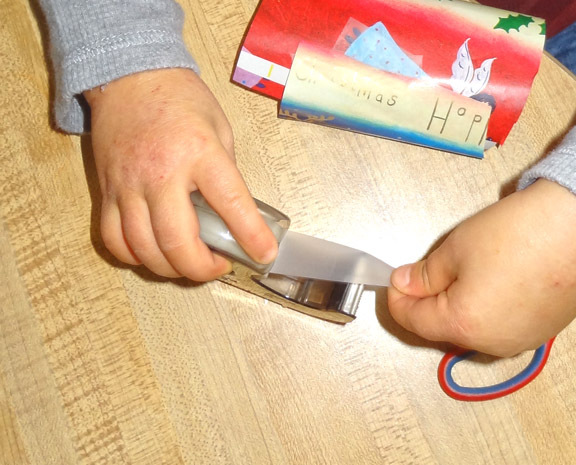 Then the kids had to fold the wrapping paper around their blocks, and use the tape to hold the wrapping paper in place. Some of the gifts ended up with some pretty creative wrapping! The kids were super excited to give me and my husband our “gifts” to unwrap. And I get so much pleasure out of the unbridled joy they feel by getting to participate in these holiday traditions. Christmas game: What’s in the bag? What a great idea! My 3 year old would love this! 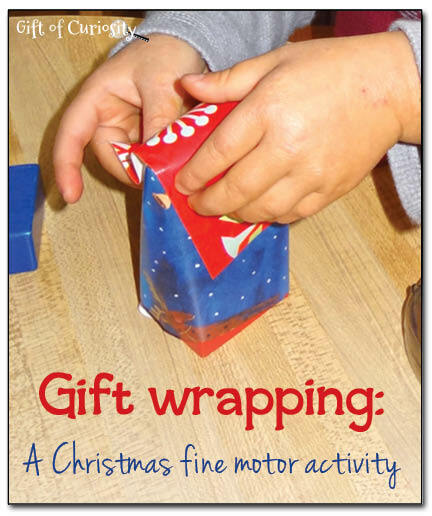 Yes, gift wrapping can be such a good activity to keep little ones busy and learning. Thanks for sharing with Afterschool. My daughter is a huge fan of wrapping gifts! She wraps anything she can find around the house for her pretend birthday parties! Good to know she is building her fine motor skills at the same time! This gift wrapping station looks like so much fun. My daughter would love it!